A super wide angle lens with a diagonal angle of view 82°, developed based on Topogon (manufactured by Carl Zeiss, Germany. Angle of view: 100°. f/6.3). 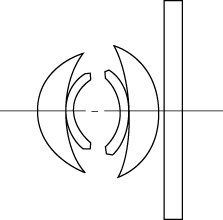 This lens has a unique optical system: a spherical lens element with a very high refraction index is used as the first lens element and a special optical glass lens element with the infinite radius of curvature is used as the rearmost lens element. 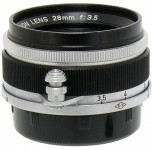 This lens was the fastest lens in the world as a 25mm lens at the time. Canon's new amber Spectra-coating was introduced with this lens to give life-like qualities in color photography.